Discussion in 'Model X' started by MaxK, Jan 3, 2016. Here is the longer video I promised on towing and the Wh/mile data. The car tows beautifully. Very nice video, thanks!!! Given the range impact, do you see it affecting your ability to take your boat to the places you normally would take it? In other words, do you feel the X will limit you as to where you can take your boat? Are you happy with the towing range or did you expect it to be longer? I was not sure what to expect as far range goes. I was surprised how much an increase from 55 to 60 mph had on range. There are some lakes in Central Florida with no SC along the way that we go to every year that we may still have to use our Navigator L.
Seems the energy usage is roughly 2x - 2.5x pulling the boat? I guess it makes sense if your boat is nearly 4900lbs! Longer trips could be problematic when towing such weight, however! Roger that, good to know. On the flip side it was also good to see how well it did tow despite the impact to range. It'd be interesting how feasible it would be to charge at those lakes you reference while you're there with your boat. Great video. That was a huge jump from 55 to 60 mph. Something like ~200 wh (576 Wh/mi vs 893 Wh/mi)!! Would be pretty curious to see how your JetSki affects things. How is it at the ramp? We need some launch videos. And tow that XP! thank you for posting! Now I have to get the 90 with towing. Ugh. This sort of dashes any hope of road tripping across the country with a camper trailer. Maybe - two factors that contribute to the energy consumption we saw here, that will be more friendly to you traveling across country with a camper trailer. The first is this boat Max is towing is at the weight limit of 5000 pounds. Of course, if your camper trailer is also ~5k pounds, then you'll have the same energy consumption due to the weight being towed. The second issue here that I expect the camper is better at is the aerodynamics of what's being towed. I don't actually know - maybe Max or somebody else who actually knows can speak up - but my assumption / guess here is that the typical camper trailer is a better aerodynamic body to be towing than that boat (nice boat btw Max!). Whether better aerodynamics and hopefully a lighter load being towed, combined, is enough of an energy consumption improvement to be able to take your trailer and go camping across the country is a different question. I would like to see more data points from different load levels, different aerodynamics, and also different terrain. I wonder what energy consumption Max might see going up and down some hills And no - Interstate overpasses aren't hills! Max - thanks for posting. This answers my first question around towing. It's pretty clear Model X will do what I need it to do - haul ~2 tons worth of utility trailer (and mostly a lot less) for oddball Home Depot, compost, etc.. runs around town. 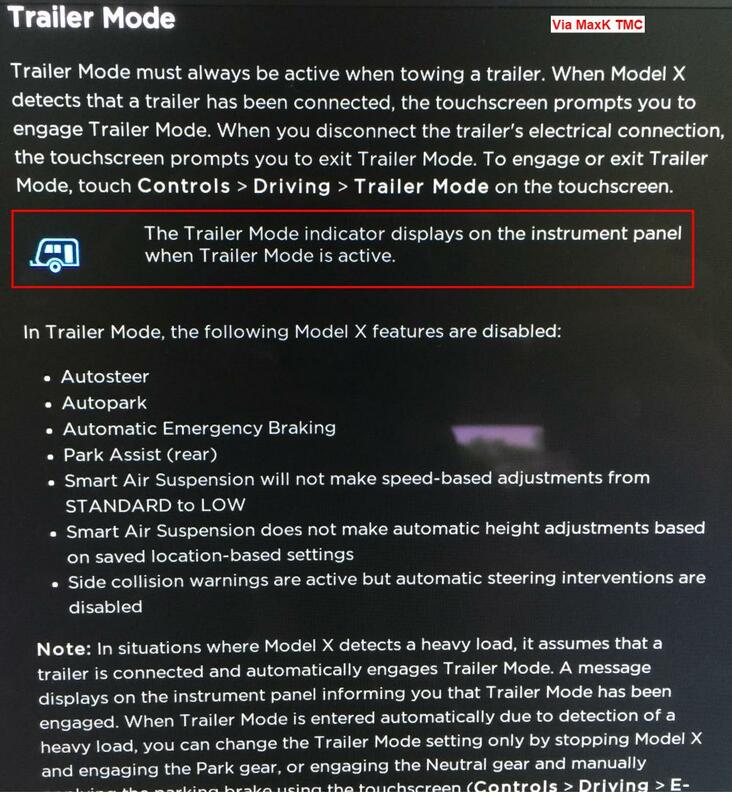 For me, the towing mode means Model X will be two vehicles in 1. Good points. I think for Model X to be a realistic solution, it needs to have enough range to make it from supercharger to supercharger, which means somewhere in the neighborhood of at least 150 miles at 55mph. Of course there will be 50amp charging at campsites which is sort of the point anyway, so maybe it will work out. Referring to accelerating the model X with a 5000 lb boat. "Like it's not even there. . . but it is!" I don't see this work out for me to tow my boat (too heavy), so I'm thinking I can skip the tow package- save $750, but can I add it after if I decide that I'd like to tow? Love the MX, and found the OP's demo video fascinating. But I can't help but fixate on the apparent WH/M consumption for towing a 4800lb boat, a load within permissible limits, in fairly idyllic conditions in Florida. Range-wise it seems it turns the MX into a Nissan Leaf. How practical can this actually be for towing if the range hit is that great, requiring charging stops every 85-100 miles or so? At a guess of 600 wH/mile, your range is cut in 1/2, so... 130 miles towing. not bad. also consider 95% (or whatever) of those huge SUVs in town... never tow anything anyway. Blue icon is a trailer for Trailer Mode it appears. The real answer of course is a nuanced answer for each individual. This is why this video and information is valuable for me personally - I have an idea of what I specifically want to do, and this video gives me confidence that my actual towing needs are going to fit somewhere within the comfortable capability of the Model X. That's a combination of both how big / heavy of a load can be towed, along with how far it can be towed. On the other end of the spectrum, we have people buying big pickup trucks to tow 5th wheels, with the package being an RV replacement. Clearly Model X isn't in that conversation (nor is it intended to be in that conversation). If you have a similar size/weight boat as Max's, and you drive 150 miles one way to put it in the water, and you don't have 1 or 2 superchargers along the way, then this isn't going to work for you. 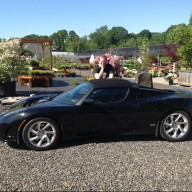 And might not work even with the superchargers (navigating the boat into the parking lot of the supercharger, unhooking somewhere convenient to go charge, and then returning and reconnecting, sounds like a pain in the rear to me - especially in a smaller parking lot). But that's me. I wonder if Max is planning to supercharge with his boat in tow, and can tell us how that goes? Of course, if you go 30 miles round trip to drop your boat in the water, then Model X totally has you covered. I don't know where typical towing usage falls which would address the more general question. The response by Tupelo I think gets to the investing side of the question. Whether Model X towing, and EV towing more generally, is actually impractical (today) may be true in practice. The incremental energy consumption from real towing may be so high as to turn very high capacity EV's into short range vehicles with spotty charging opportunities. That may be real for most people, and it may not matter at all from an investing point of view - the marketing value of being able to say with a straight face that this EV can tow 5,000 pounds and do it well (which is true, even if range is more limited than people like), is likely quite high. To the extent that people tow things that takes them into places with little or no charging infrastructure, the high incremental energy consumption will have an outsized reduction in the utility of the vehicle. To the extent that people tow things to RV parks that are highly likely to have destination charging awaiting at most parking spots, the utility of the vehicle will be increased. I'm really looking forward to see wh/mile numbers from towing other loads - lower weight and more aerodynamic in particular, as well as how it looks hauling something over a real hill. Many seem to be focusing on the weight of the trailer. Weight has little effect when you go on a flat road (like in Florida). And even small ups and downs don't matter much as they even each other out. When keeping a constant speed, the total weight makes very little difference. It increases rolling resistance on the tires a little, but that's about it. It does take more energy to accelerate more weight, but you do that only once. So again, that's not a big factor. Part of it you get back as more regen. The real kicker here is air drag. That's the largest part in energy consumption at 60 mph even with a very aerodynamic car. With a huge boat in a trailer, you are seeing serious air drag and that's what causing the higher energy consumption.